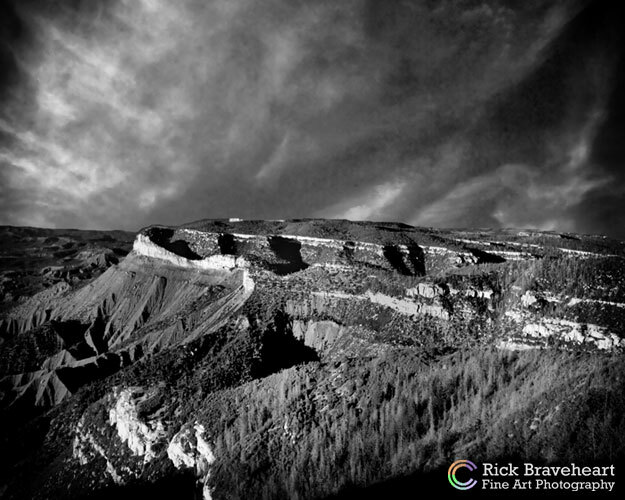 An approaching early Spring storm produces a dramatic sky and striking contrasts against a mountainside at Park Point in Mesa Verde National Park, Colorado. To honor the ancient history of this land and its early Ancestral Puebloan people, this image was photographed with an all-wood 'Seneca view camera' equipped with a large bellows that was manufactured in 1907. With this type of camera the photographer composes their photo while watching a large glass screen and while draped in a dark cloth to make seeing the screen easier.